← CHEESECAKE! Need a Better Reason to Go Raw for a Day? If there is anything I miss about my old way of eating, it’s pork bacon. I generally cut out pork products a few years ago because it contained too much fat. Nowadays I continue to eliminate pork from my diet because the Bible prohibits it (who am I to argue with God…). If you are still a meat eater, turkey bacon is fine — just be sure to read the labels as many of them still contain pork products and other unGodly fillers you don’t need in your body. There are some vegetarian and vegan versions out there. My personal favorite is Smart Bacon by Light Life — which you can find in the fresh produce section of your mainstream supermarkets (it is generally cheaper at mainstream supermarkets than those that cater to the organic/vegetarian crowd). Smart Bacon is best cooked in a nonstick skillet in olive oil so it can get dark and crispy — that’s my preference. You’ve got to eat it as soon as you cook it though. I tried putting on a sandwich and taking it to work for lunch. Let’s just say I wound up getting a sandwich at Subway because the taste of that bacon transformed into damp cardboard! I have also tried smoked tempeh bacon, which I don’t really care for. It is cut too thick and tastes more like wood in my humble opinion. But you can decide for yourself. 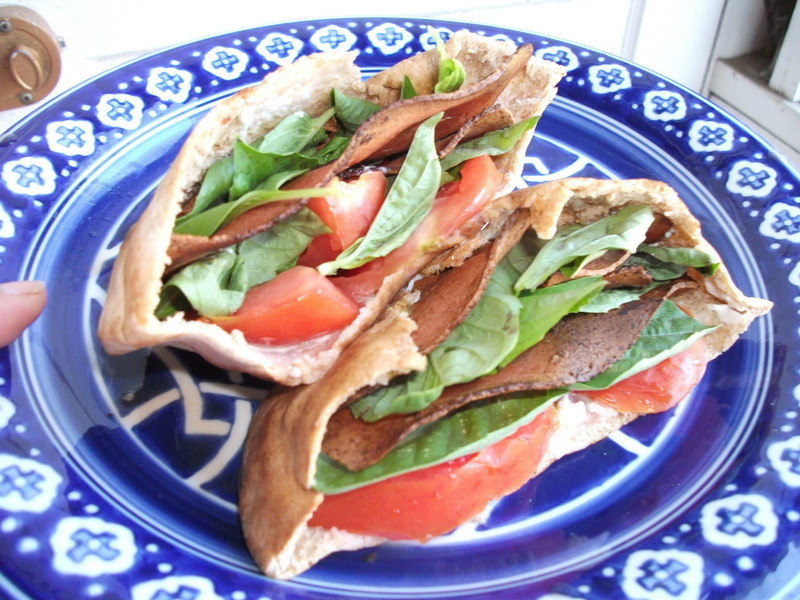 I made this Bacon, Basil, and Tomato Sandwich on a day I ran out of lettuce. I have this terrible habit of not using all the produce I paid for, leaving some food to go to waste. I am making a strong effort to use everything I buy before heading out to the grocery store to buy new produce. So I decided to utilize some of the beautiful organic basil I bought at Shoppers on sale for $.99 (this grocery store tends to be much cheaper than most mainstream grocery stores and they do sell some organic, gluten free items). This sandwich is a quick comfort food for hot summer days when you don’t want anything heavy or anything that requires too much time at the oven. However, please understand that I am not saying you should eat this bacon everyday (vegan or otherwise…). It is still a processed food product and should be enjoyed sparingly. Heat up a nonstick skillet. When pan is hot, place the bacon slices in a pan. If you are using Smart Bacon it may be difficult getting it out of the package in one piece. Just get a butter knife, wedge the knife between the first slice in the MIDDLE, and gently slide the knife to the out edges. Take about a teaspoon of olive oil and drizzle it directly on the bacon slices. You don’t need any more oil than a teaspoon. Use the back of the spoon to coat the entire bacon slice with oil. When the slice begins to brown on the outer edges to your liking (2 to 3 minutes), turn over and cook for another minute or so. When the bacon is done, transfer to a paper towel to soak up extra oil. Warm the pita in a hot, dry pan. Perhaps a toaster would work, but I am kitchen space challenged — so I don’t own one! Cut the tomato into thick slices and sprinkle with a little Spike seasoning. When the pita is warm, remove from the pan and slice it in half. Spread a little vegenaise on both sides. Put the bacon, basil leaves and sliced tomato in both sides. This is great with some sweet potato fries, your favorite chips, or a side salad. Enjoy! Halona Y. Black recently lost 22 pounds in a month during a 30-day raw food challenge. Halona is a self-trained, at-home cook who wants to become a certified raw food chef so badly that she is vacating her comfy 1 bedroom apartment for a small room. Her secret mission in life is to teach young, busy women to learn to cook already. You can contact Halona at GarlicAndLemons@gmail.com. This entry was posted in recipes and tagged bacon, sandwich. Bookmark the permalink.